“Lost in a Story: Beyond Reality and Time” from Christian Faith Publishing author Joseph H. Krasinski takes the reader along with siblings Joseph and Victoria on a mind-bending adventure outside of the confines of time and space where they meet the wise shaman Totem, the Old Storyteller, come face to face with Challengers, and learn valuable life lessons before returning home to their own time. “Lost in a Story: Beyond Reality and Time”: a thrilling adventure story featuring siblings finding their way home from another realm. “Lost in a Story: Beyond Reality and Time” is the creation of published author Joseph H. Krasinski, a retired landscape architect born in New Haven, Connecticut, whose powers of storytelling were awakened by a bedtime story routine with his now-grown children. Sometimes in one’s life, a sequence of events flashes through us as though we’ve had this experience before but at a different place or time…and possibly at another level. This story, takes the reader into this realm as a family venture on a holiday camping trip as the brother and sister wonder off during the night and travel unknowingly through a Crease in time where they are greeted by a Shaman who counsels and guides them back to their rightful place in time with the assistance of the Old Story Teller, ‘Noita Nigami’ who weaves the story to keep them from wandering astray on their return home. Along their journey they encounter twelve malevolent characters who each bring a different challenge to which the Shaman has provided a protector to defend against, followed by a life lesson from each. Published by Christian Faith Publishing, Joseph H. Krasinski’s new book is an enchanting mix of fun and danger, where the adventurous siblings step through windows of history and see their own memories differently. Krasinski’s well-honed sense of storytelling invites the reader to lose themselves in the narrative, even as the main characters do the same and find their way back. View a synopsis of “Lost in a Story: Beyond Reality and Time” on YouTube. Consumers can purchase “Lost in a Story: Beyond Reality and Time” at traditional brick & mortar bookstores, or online at Amazon.com, Apple iTunes store, or Barnes and Noble. 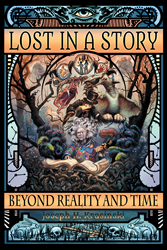 For additional information or inquiries about “Lost in a Story: Beyond Reality and Time”, contact the Christian Faith Publishing media department at 866-554-0919.